Repsol thwarted an attempt by cash-hungry shareholder Sacyr to oust boss Antonio Brufau last week and warned it not to destabilise the oil company's management. Spanish builder Sacyr, Repsol's largest shareholder with 20 percent, did not attend a special board meeting which reaffirmed a long-term growth strategy and investment plans including 9.3 billion euros in upstream operations. Support from Repsol's second largest shareholder, savings bank La Caixa with 14 percent, was key to the decision. The chairman of heavily-indebted Sacyr, Luis del Rivero, has openly criticised Repsol's decision to reduce its 2009 interim dividend by 19 percent in favour of heavy investment. "For a foreign investment fund it's not pretty to see a clash on the board of a major oil firm because its main shareholder wants to put its own financial interests ahead of Repsol's," Portuguese bank BPI analyst Javier Barrio said. "Large investors will see this and want to look for another oil company. No one wants an investment with instability factors," he added. Industry Minister Miguel Sebastian declined to comment on Repsol's internal affairs but was concerned for the image of Spain's biggest oil and gas firm. "We have full confidence in Repsol's shareholders and their chairman. 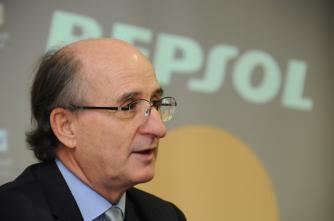 What we want is for there to be no damage to Repsol's image," he told journalists in Seville. Since Repsol chairman Brufau took office in 2004, Repsol has turned around its petroleum resources after years of declining reserves, thanks to multi-billion euro investments in oil and gas exploration. Repsol's investment drive has coincided with a global financial crisis which depressed oil and gas prices as well as refining margins, obliging the company to cut its 2009 interim dividend. Spain's biggest oil company needs three to four years to develop its Brazilian reserves before they can start making money for the company, although it does not rule out listing part of its operations in the country to raise cash beforehand. Sacyr, with a 12 billion euro debt pile and market capitalisation of 2.69 billion euros, is highly exposed to Spain's languishing property and construction sectors, but the sale of its Repsol stake at current prices would generate a capital loss of nearly 2 billion euros. Another factor limiting its ability to exit its Repsol stake is the issue of the potential buyer. The Spanish government has so far openly opposed stake sales to potential buyers from Russia and China, and has said it wants to keep Repsol in Spanish hands.